Starting with 15th October 2018, all the documents related to Conceptual Framework are available on www.agrilink2020.eu (https://www6.inra.fr/agrilink/OUR-WORK/Developing-the-conceptual-framework). To ensure an easy and more focus reading, 23 separate documents presents the multi-level conceptual framework of the research and innovation Horizon 2020 project, AgriLink. The elaboration of this Conceptual Framework has been coordinated by The James Hutton Institute, leader of AgriLink’s Work Package 2. A first version was submitted as deliverable D1.1 of AgriLink, Month 6 of the project (November 2017). This updated version has been issued on 01/05/2018. A new version will be uploaded by the end of the project, enriched by new primers and a revised overall framework. Conceptual frameworks typically represent an initial step in European Commission-funded research and builds on the state of the art escribe on Grant Agreement, to explore further detail and depth to the theorisation, providing a foundation for methodological development and data analysis in the empirical workpackages (WPs). This living document has gone through a transdisciplinary process, with implication of both practitioners and researchers in writing, editing or reviewing the manuscript. 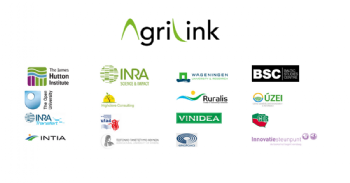 This participation has been organised within AgriLink’s consortium and beyond, with the involvement of members of the International Advisory Board of the project, including members of the Working Group on Agricultural Knowledge and Innovation System of the Standing Committee on Agricultural Research of the European Commission. The Conceptual Framework main report has been designed to be read by a variety of audiences. Section 1 outlines the context to the AgriLink project. Section 2 presents the key challenges addressed by AgriLink (sustainability, innovation and AKIS). Section 3 elaborates the theoretical approaches and considerations underpinning this research; the bulk of this section is primarily intended for social science audiences. Other readers may wish to focus on the ‘Application to AgriLink’ sections, which summarise the practical use and application of the theoretical concepts. Section 4 presents the transdisciplinary components of AgriLink. We conclude with research questions and next steps in Section 5. Also, if more details are needed, all the available theory primers can be found on the website, in separate documents. The H2020 AgriLink project (Agricultural Knowledge: Linking farmers, advisors and researchers to boost innovation) seeks to stimulate sustainability transitions in European agriculture through better understanding of the roles played by advice in farmer decision-making.